PiratePalooza.com :: Buy My Books! 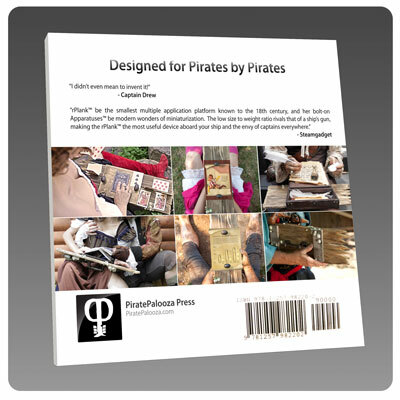 PiratePalooza™ Press was created for and is dedicated to the discovery, curation and re-publishing of the works of the space pirate Captain Drew in order to ensure that his words and ideas are preserved for the edification of future generations of pirates throughout the galaxy. Once described as being "What Douglas Adams would have become if he'd been bitten by a radioactive pirate," Captain Drew continues to exert his influence on the course of pirate history. 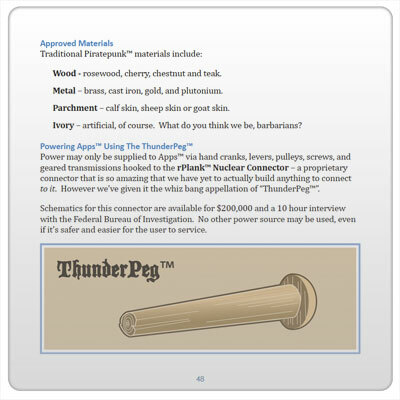 In addition to the Captain's existing library of known, suspected, and theorized work, PiratePalooza™ Press has secured an agreement to publish newly written works by the Captain, such as the 'owners manual' for the rPlank™, published in 2011. PiratePalooza™ Press is pleased to announce that it plans to release a restored version of the Captain’s first published work this Autumn. Captain Drew mistakenly made his first professional short story sale in 1735 when he mistook the publisher of ‘Tumbus Poematis’ for a bear-baiting betsman, passing him a small bag of Spanish gold, a petrified ear named 'Jenkins'1, and an incendiary manuscript whose contents would spread like wildfire through the halls of Parliament while George II was out of the country, nearly wrecking the nation’s currency and ultimately leading to a declaration of war with Spain in 1739. 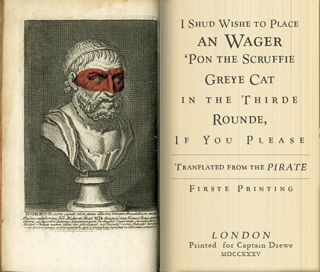 “I Shud Wishe to Place an Wager ‘Pon the Scruffie Greye Cat in the Thirde Rounde, If You Please” became such a politically-charged document that the Captain was forced to flee the planet until all those involved had died off or lost interest. He was unable to take advantage of the fame his poem attained and never did collect upon his winnings (mostly due to the fact that the publisher used the bag of gold to finance the printing of 50 badly made broadsides and a rambling beach estate in Dover). Thomas Grey and Horace Walpole would later attempt to cash in on the success of the Captain’s poem by releasing a similar cat-themed ode, but the Captain’s is still considered the best. 1739 - Stop Publishing My Notes! 1736 - Please fetch me a nice round goose. 1735 - Mrs. Marley, Remove Your Fishwives from my Gangplank, posthaste! 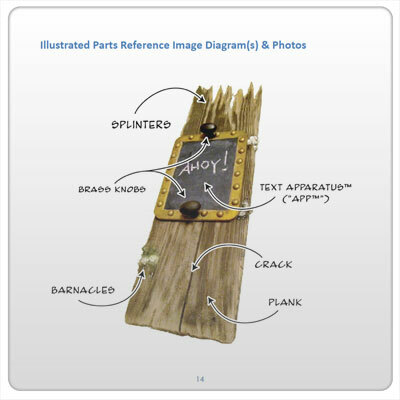 The best and only survival guide to the rPlank™ − the preferred mobile platform for pirates on the go! Employing a system of Apparatuses (called "Apps" for short), the rPlank™ can do just about anything. Better than Steampunk, the rPlank™ uses Piratepunk™ technology! Available in color, black & white, and electronic versions - trade some of your gold for it today! I received my copy of rPlank, The Official Survival Guide in the mail today. All I can say is what a technologically advanced piece of equipment it is and the Survival Guide tells you all you want and need to know about the rPlank. 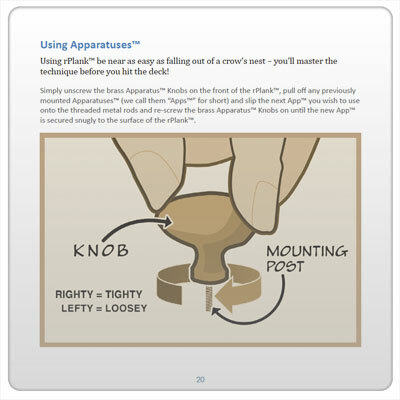 It has easy to understand colored illustrations of all technical aspects. You can operate it from day one and most importantly be able to discuss it’s makeup and operation intelligently with other Pirates and Lubbers alike! 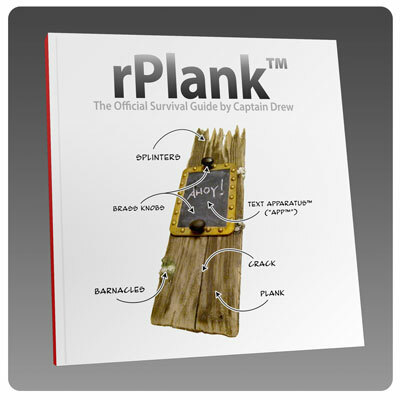 Even if you do not own or intend to own an rPlank you need to get the Official Survival Guide so you will be educated on the modern advances available to todays Pirates. And as a side note, it is HILARIOUS!!! Get your’s today! Tell em Dungeon Dan sent ye! This book is carefully designed to be just short of 1/2 cm thick, thus it is easily adjusted as a shim to fit under any wobbly table that gives you grief around the house. It can also be read, if you're in a pinch for something to do when caught between typhoons in the middle of the Pacific. Captain Drew brought new life to such underused phrases as "write a good review or I'll put you in the brig" and "hope you don't mind the smell of the bilge water down there while you decide if you're going to write that review or not", neither of which appear in this work. What does appear is a guide to the use of the rPlank, the new technology that is already adopted in all civilized worlds, and will become the standard of choice should the Earth ever hope to join in interstellar commerce with the rest of the galaxy. So, put down those shiny white baubles and embrace the rPlank! And, when you do, you'll need this handy guide, priced moderately for the savvy consumer. Now, I'd like to be let out so I can go home and count what's left of my toes. This guide leaves all the other rPlank guides in the dust! This guide tells you all you need to know about both usage and development of applications for the rPlank. Accept no substitutes! How the Captain gained possession of the ear was never fully settled. This list is significantly abridged, as suspected new works continue to be discovered around the world and must first be examined by trained Captaindrewologists. Are these books for real? YES! YES! YES! The books featuring links to Amazon, Barnes & Noble, the Apple iBookstore, and Lulu are absolutely real and we'd love it if you bought one! They're made to be read and we'd love to pay for our investment in quills for the Captain. So does the Captain actually write these books? The Captain relates his stories and adventures to one of our writers, who develops a text which can be understood by most readers while preserving all of the excitement and bluster of the Captain's original stories. So what are the quills for if he isn't writing the books? Does the Captain do book signings? He does, and can. If you'd like to have him appear at your bookstore please contact us (see above). Does the Captain do speaking engagements? As his schedule allows, and depending on the venue and audience. We're sorry, he refuses to speak to Klingons.